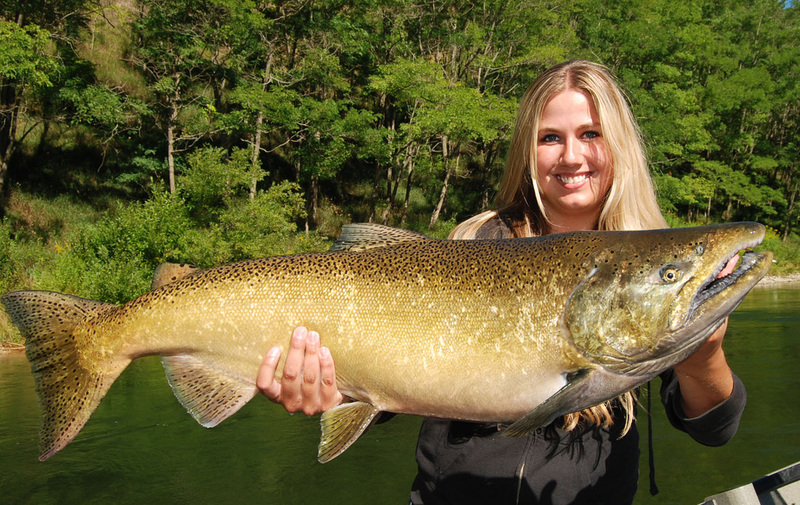 Kelsey with a gorgeous Manistee Salmon. Casting Thundersticks for early Salmon below Tippy Dam. Float fishing Spring Steelhead on beads! Come Join us for excellent Fall Salmon fishing on the Big Manistee River below Tippy Dam. Salmon season is best from Labor Day through late October when huge numbers of Chinook and Coho Salmon ascend the river and move up stream towards the Tippy Dam area near Wellston. September – October is best. We offer anglers a choice of spinning tackle, bait casting gear, or fresh water fly fishing equipment for Salmon and Steelhead fishing on the Manistee, Muskegon, and Pere Marquette Rivers. Dates are now available for the Big Manistee River below Tippy Dam. During the later part of October, Fall Steelhead fishing is available, as well as resident Brown and Rainbow Trout. Starting to see big numbers of fall Chinook (King) salmon in the upper sections of the Manistee River below Tippy Dam. Salmon are actually larger this season due to plentiful bait fish in Lake Michigan. Salmon have been healthy with more entering the river each day. Northeast winds over the past few days have brought in good numbers of Chinook (King) salmon, Coho, and Skamania Steelhead. There has also been a few Lake Run Brown Trout. Manistee River Salmon Fishing Adventures in Michigan. Located in North Western Michigan, the Big Manistee River is one of the most beautiful and productive rivers in Michigan. The Manistee is a large, broad river, very similar to the centrally located, Muskegon River. The Manistee River is a mecca for early Season kings. Chinook Salmon ascend the Manistee River below Tippy Dam, a solid month before most rivers in Michigan. Good numbers of Salmon can be caught as early as late July. By late August, the Big Manistee Salmon run is full swing! Manistee River Guided Fly Fishing for Salmon on the fly. We also specialize in early King Salmon on Crankbaits! 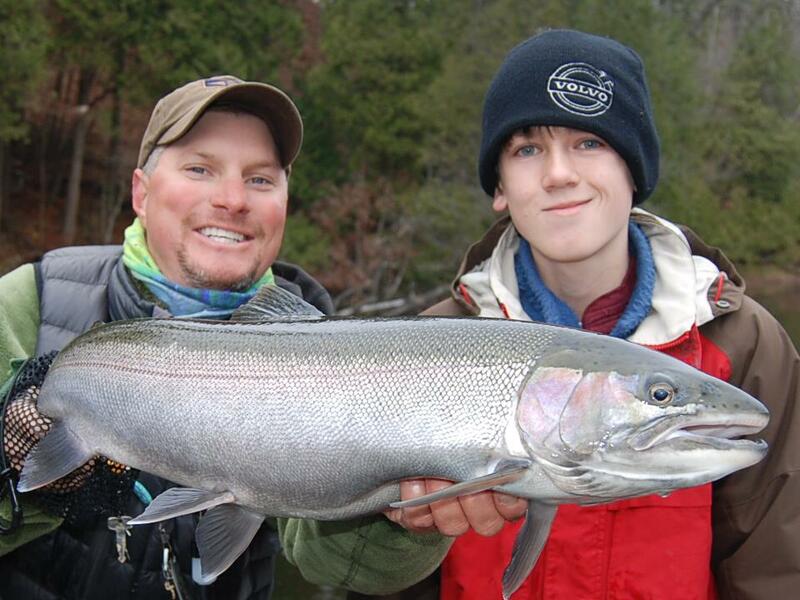 The Manistee and Muskegon Rivers have huge volumes of Salmon and Steelhead during the Fall Months. When fishing the Manistee River we commonly go after Chinook, Pink, Atlantic, Coho, Skamania, Steelhead, and Trout during the fall months. The Big Manistee River is also one of the few rivers in the area where anglers can target Coho Salmon as well as Chinook and Steelhead. This river also has a very nice population of resident Brown and Rainbow Trout. During September, we guide the Manistee River for Salmon during fall season months for Trout, and Steelhead. The Manistee River trout fishing is also very good during September and October for resident trout behind salmon reds. The Manistee River excels as a fly fishing River for Chicago anglers wanting large Salmon. Salmon fly fishing on the Big Manistee Rivers is fantastic!